This scenic ranch, surrounded by more than 65,000 acres of National Forest, is the jewel in the necklace of The Fly Shop's Private Waters and welcomes a limited number of guests from mid-May through October. Anglers staying at Antelope Creek Ranch enjoy wonderful accommodations, great food, and absolutely terrific trout fishing that begins right at the doorstep. The lodge is within a stone's throw of the serpentine, fish-filled private meadow stream and within walking distance of the ranch's two trophy trout lakes. There are nearly two miles of the creek on the ranch and 9 more miles of roadless stream above the fenceline. Mike and Bertha Michalak, owners of The Fly Shop, purchased the ranch in 2002 and, using of a team of environmental experts, began one of the most ambitious private stream, meadow, wetland restoration and enhancement projects in this part of California. 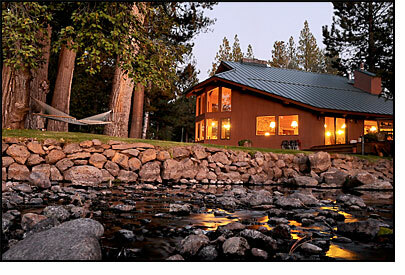 The magnificent, two-story Antelope Creek ranch house accommodates 8 fishing guests in style. Each one of the spacious four bedrooms has a private bath and wonderful view. The cozy fireplace sets the mood, and you can watch deer stroll, stars fall, and trout slurp from the jacuzzi hot tub on the back deck. Delicious meals are included in the package, and served around the fishing schedule. The two-story lodge living room has a massive stone fireplace, a sunken bar, wraparound decks and windows looking out over picturesque Antelope Creek to the meadow and mountains beyond. 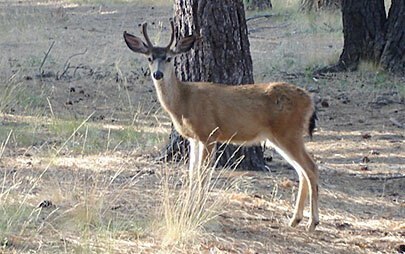 There is a quiet, park-like atmosphere and the historic ranch is surrounded by nearly 35,000 acres of national forest. The hundreds of acres surrounding the lodge are beautiful, with large grassy meadows and an open panoramic vista of the surrounding mountain bowl. Guests can see for miles from the streamside deck and there are no other buildings, homes, or lights within sight to mar the view. 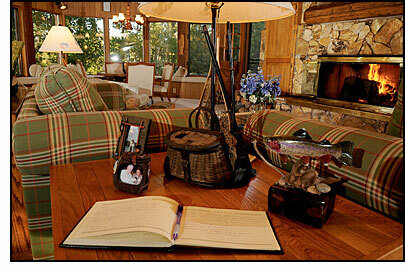 The historic cattle ranch is an ideal vacation spot for both serious fishermen and their families or friends. 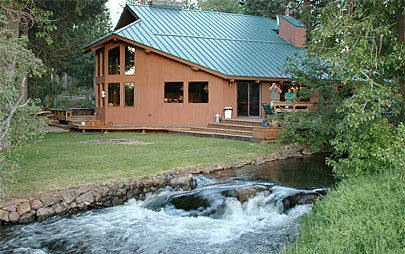 At just over 5,000 feet elevation, Antelope Creek Lodge is an ideal mid-summer and fall angling retreat. 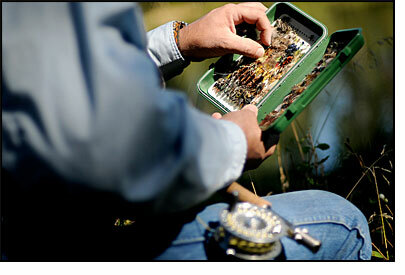 The ranch enjoys cool, pleasant weather and great fly fishing conditions all season long. There are several golf courses less than an hour away, two adjacent National Forests with hundreds of miles of hiking trails, and several of the American west's largest waterfowl nesting and viewing areas only minutes away. The daily rate for Antelope Creek Ranch fly fishermen is $395 per person (double occupancy) and $475 per person (single occupancy). Packages include all meals, accommodations, and access to all the ranch facilities for the anglers, and there is a two-night minimum stay. Non-angling companions are welcome at a more modest fee of $195 per day, per person. The non-angling packages include all meals and accommodations, and options are explained in detail in the sample itinerary portion of this website. While fine, complimentary wines are served with evening meals, guests are encouraged to bring their own beer, soft drinks, liquor, and mixes. Ice tea, lemonade, and unlimited bottled water is always available in the bar and kitchen. The Antelope Creek Lodge experience is designed for a maximum of eight anglers, and we generally limit the total number of guests to that number. Four couples, with wives not fishing would translate into four anglers, four non-anglers and the maximum of 8 guests. Of course there are many combinations that accumulate to a maximum of eight. For special occasions, large families, and groups, Antelope Creek Lodge can be expanded to accommodate up to 16 guests, using the Michalak family's private residences only a stone's throw from the lodge. Rates for these groups and families can be discussed and will be based on the number of guests, length of stay, and amenities/support staff required. Reservations can be made as far as two years in advance, and many summer holidays at Antelope Creek Ranch are arranged that far ahead. The fishing season is from mid-May through mid-October. To make a reservation, please give us a call at 800-669-3474 during business hours any day of the week. We will answer whatever questions you may have and let you know where the openings are for Antelope Creek Lodge, and confirm your reservations in just minutes. If you prefer to correspond on-line simply email us using the contact form below and we will respond promptly. It is always a joy to talk to our clients about our own ranch. While we are proud of all our Private Waters, we feel that Antelope Creek is truly "the jewel in our necklace of regional destinations." It has attractions for the novice and expert alike and there is no destination in our portfolio better suited for non-fishing companions. After a verbal confirmation of your reservation you'll receive a short confirmation letter showing the dates of your stay, terms of the booking and an invoice showing the cost of the trip. A 50% deposit is normally due 6 months before the trip is scheduled to begin. Final payments are due 2 months in advance. Deposits and final payments can be made with either a credit card or check. In order to comfirm reservations made more than 6 months in advance of the trip, a good faith deposit of 25% is required within two weeks of the verbal confirmation. Deposits are fully refundable, less a $100 service fee, if cancellations are received more than 90 days in advance of the scheduled visit. In the event that reservations are cancelled within 90 days of the scheduled visit, they are non-refundable. However, in the event that we are able to find replacements for those cancelled dates, the entire deposit, less the $100 service fee will be refunded. The cold water of Antelope Creek pours out of alpine aquafirs and tumbles off the slopes of nearby Mount Shasta before settling into its tranquil, meandering nature as it courses across our ranch. Simple irrigation diversions control the flow in the main stem of the creek and the stream runs clear and fishable every day from the middle of May through the end of our season in late October. Antelope Creek carves its path through the middle of the ranch and offers nearly two miles of meadow fishing for rainbows and resident brown trout. The creek is not broad, but typically cuts under banks, tails out in flats, and forms deep pools. Twisting and turning its way through the ranch, intermittently dividing the meadow and cutting through the surrounding willows and evergreen forest. 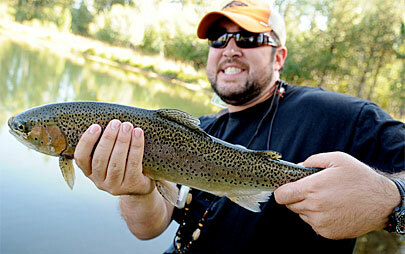 The fish in the stream are not routinely large, but there are quite a few browns and rainbows that will top two pounds. 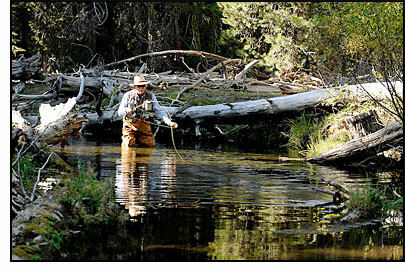 Easily spotted in the placid creek waters, and sight-casting to specific trout is commonplace. The two lakes on the property have healthy populations of trophy rainbows and browns that will make any angler's heart race. In fact, each year several of our guests take home photos of themselves smiling with 30+ inch trout ready to be released. The upper lake is small and can easily be fished entirely from the shore. It is surrounded by many varieties of trees and is a pleasure to experience. The lower ranch lake is larger and can accommodate several float tubers, though it can also be fished effectively from shore. In May and June the high (5000') altitude translates to cool mornings and evenings and guests at the ranch house usually rise to a morning fire in the lodge's beautiful stone-lined fireplace. Hatches aren't heavy in the creek or either of the two trophy trout lakes until late in the morning, when the sun hits the water solidly, its warmth stimulating the insect activity - and the trouts'! Fish feed actively all day long and leeches, streamers, and nymphs are very effective throughout the day. The single most effective dry fly and nymph fishing in the stream are small mayfly imitations, while standard damselfly or water boatman patterns work well in either of the two lakes. Slowly retrieved streamers and small, bead-headed patterns are equally productive. Midges are very active in the spring months, and imitations continue to work well every day of the season. Sometime early in June there is a migration of termites that moves through the high mountain forests. 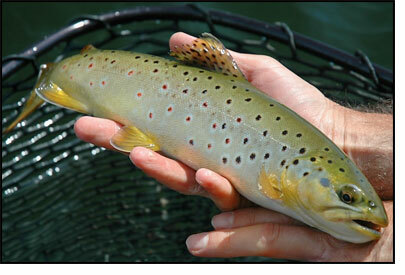 Trout begin rising with apparent abandon to beetles and ant patterns that resemble the termites. Moreover, the water boatman that begin to hatch in early to mid June is one of the most excited stillwater hatches you will every come across. The water boatmen are very fast and have the unique ability to both fly and swim, which enables them to tantalize the trout into very aggressive takes. Once you've experienced the water boatman hatch at Antelope Creek's lower lake you'll want to come back year after year. The ranch comes alive with wildlife during the this time of year, and it isn't unusual to have dozens of mule and blacktail deer foraging in the meadow adjacent to the lodge. Bald eagles, osprey, Great Blue Herons, and a non-stop migration of songbirds add color and sound to every spring day. July and August at Antelope Creek Ranch contrast dramatically with the scorching summer weather of the Sacramento Valley. The high (5,000') ranch elevation generally supplies the most pleasant and consistent mid-summer weather in Northern California. At the same time, the terrestrials start to come out, and grasshoppers blown into the lakes and the stream become a prime item on the trout menu in mid-summer. Leeches, streamers, midges, callibaetis nymphs and dry flies, beetles and ant patterns remain a staple in every Antelope Creek fly box. September and October are spectacular at our ranch from both a fishing and a visual perspective. The groves of aspen turn brilliant shades of yellow, contrasting vividly with the evergreen forest. Hunting is not allowed on the ranch and herds of deer, intuitively knowing that they are protected, congregate on the property. The fishing remains very consistent throughout the fall. Hatches are predictable, the selection of flies doesn't change much, and guests are once again met in the morning and end their days with a warm fire in the ranch house. • 9' or 10' leaders tapered to 4x - tippet spools of 4x, 5x, and 6x diameter. • While many mid-summer fishermen wade wet in sneakers, sandals, or wading boots, hip waders are perfect for the stream or for fishing from shore on the lakes. Chest waders are needed if you plan on float tubing the lower lake. You'll be asked not to wade in the edges of the lakes as the drop-offs are steep. You may have to get your feet wet when landing one of the larger fish, otherwise please avoid wading. Also, keep your wading to a minimum when fishing the stream. You may cross when necessary, but please avoid wading up and down stream. Try to cross at shallow gravel runs to avoid stirring up silt, disturbing the insect life, and alerting fish downstream to your presence. Bring both floating and sinking or sink-tip lines (up to type III). You'll need long leaders tapered to 5x or 6x for the dry activity, and a little shorter leader tapered to 3x to 4x for wet flies and streamers. Expect a lot of action using emerging insects just underneath the surface. Many of our regulars fish some type of dry or emerger with a dropper, short or long, and a nymph or midge pupa attached. Expect midge activity to start in early spring and continue all year. 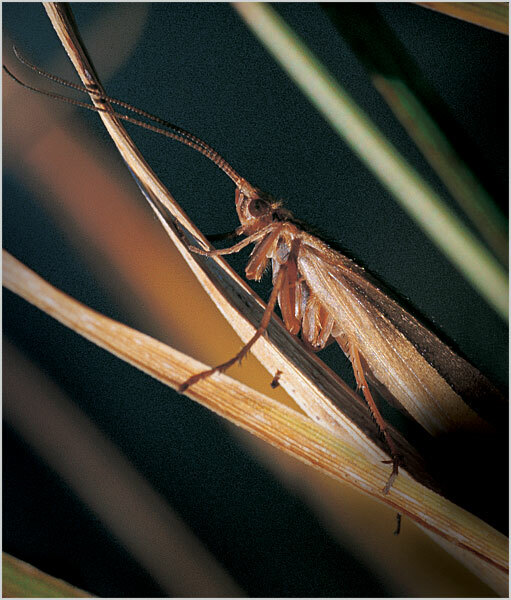 Mayflies start in late spring and early summer. 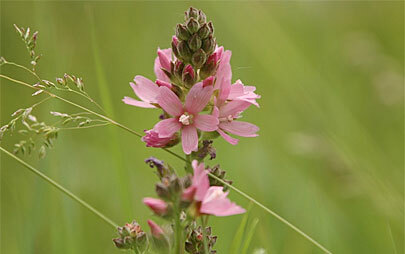 Terrestrials are effective most of the season, especially after early spring. Leeches, damsels & dragonflies patterns seem to work best from late spring on. A crystal bugger or leech with a nymph trailer can be deadly. You must experiment with various retrieves at different depths until you strike gold! Many lake fishermen have great success fishing nymphs at various depths underneath an indicator. Just let them sit there for a bit, patience is a virtue at this point, and then pull it slowly back for another cast. Water boatmen, especially from early summer on, are a staple on the lakes, especially the lower lake. Shorter leaders tapered to 4x or 5x are appropriate when fishing the stream. Deer hair flies with short droppers or no droppers will produce. Nymphs of various sizes and colors should be in your box. Yellow Humpies, Stimulators & Elk Hair Caddis are high on our list for dries, but there are a number of other popular patterns, such as Parachute Adams, that will work well. Hanging a nymph underneath these high floaters can sometimes turn the trick. Black AP's, PT's, Prince Nymphs & Golden Stones are some of the nymph patterns we usually tie on first. Small nymph patterns will begin to be the best choice in late summer & fall. Almost any bead head nymph can work in the creek at various times. This is by no means an all exclusive list of flies. There are many other patterns that will work as well in many cases. However, this is a list of flies that represent patterns that any fisherman should have in their vest. Going to our private ranches or to public water with only three or four patterns will mean you stand a good chance of not having the right fly at the right time. Although Antelope Creek Ranch is private, we still operate under Fish & Game guidelines and regulations. Fishing licenses are required and must be displayed. • Try to bring each fish to net or hand as quickly as possible. The larger ones will do their best to interfere with you doing this, but remember, the longer you play one the greater the chance they will die later. If you do find yourself in a long battle with one of the bigger ones, never take it out of the water. Use an airless release only. • Use barbless hooks and avoid using the very large streamer hooks. Fish with size 8 flies or smaller. • Please, no hard nylon nets! The new rubber mesh nets are ideal, as they do not remove the protective coating on the fish. • Avoid dragging any fish up on the bank. Use the airless release at all times. You can either reach down with a hemostat or hook disengager and remove the fly while the fish is still under water. • When taking pictures of your fish please get everything ready before lifting the fish up for the shot. Support the fish with both hands- don't squeeze- and keep it over water the whole time. Lastly---your trophy should not be out of the water for over 5 seconds. 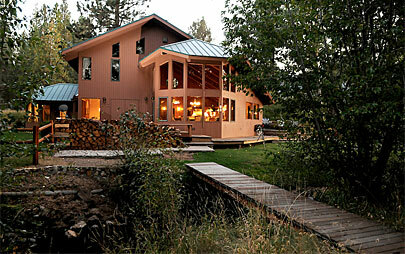 Antelope Creek Ranch is located on the northeast side of majestic Mt Shasta. 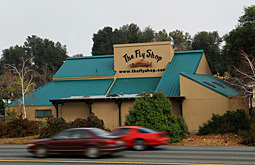 Traveling north on I-5 and then east on Hwy 97 out of Weed, it is approximately an hour and fifty minutes from Redding, the home of The Fly Shop. Every mile of this drive is a pleasure to experience, as the scenic highways circle around the forested base of Mt Shasta, with panoramic views of the region. Travel north on I-5 some 60 miles to the community of Weed. Take the central Weed off ramp. 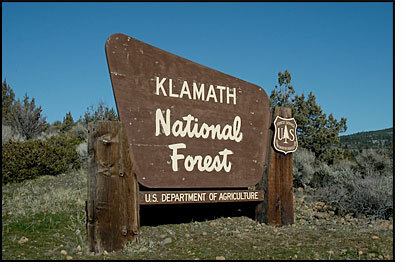 The freeway sign will mention Hwy 97 and Klamath Falls. As you come off of I-5 you will turn right on Weed Blvd and go 1⁄4 mile to the Hwy 97 turn off for Klamath Falls. Turn right on Hwy 97 and travel north and east 28 miles to the paved, Tennant road. Turn right, stay on the pavement, and proceed approximately 12 miles to the ranch entrance. You'll know you are close when you begin to parallel the 4-rail, pole fence that runs along the front of the ranch property. The ranch entrance is framed by massive stone walls and is just past the creek crossing. If you pass the end of the 4-rail pole fence, you've gone too far. Travel time is usually an hour and 50 minutes from Redding. Please be sure to close the gate behind you after entering the property. The lodge is located about three quarters of a mile from the entrance gate on the right hand side. Take the slight decline downhill to the right and, after unloading your luggage and tackle, relocate your vehicle to the most distant space available in the parking area. Take Hwy 395 to Susanville. From Susanville take Hwy 44 to its junction with Hwy 89. Turn right or north on Hwy 89 and travel to Mt Shasta and I-5. This will take approximately 1 hour and 15 minutes. Turn right onto I-5, proceed to Weed and follow the directions above. Total travel time will be approximately 4 hours and 40 minutes. Get on Hwy 89W and continue to the town of Mt. Shasta and the intersection of I-5. Turn right on I-5 and travel 10 miles to Weed and follow the directions above. Total travel time will be approximately 1 hour and 30 minutes. Take I-5 south of Yreka 6 miles to the Grenada exit (Hwy A12). Go east on A12, and travel to Hwy 97 (approximately 30 miles). Proceed east on Hwy 97 approximately 16 miles to the Tennant Road turn off. Follow the Tennant Road for 12 miles to the ranch entrance. Take Hwy 97 south to the Bray/Tennant road. It will be approximately 46 miles south of Klamath Falls, Oregon. When you pass through the community of Macdoel you will be about 14 miles from the turn off. Mt Hebron Summit is just north of the turn off. Take the Bray/Tennant road and proceed approximately 12 miles to the ranch entrance. (The street address for GPS coordinates is 12516 Tennant Road, Macdoel, Ca., 96058 though the ranch is nowhere near MacDoel and only about a mile from the community of Tennant). Please do not rely solely on GPS devices to get to the ranch, as they do not always provide the most direct routes in rural areas such as Siskiyou County. Note that there are no services (gas, diesel, or propane) withing 45 minutes of the ranch, so have at least a quarter of a tank when you arrive. It takes a little less than two hours to drive to the Antelope Creek Ranch from Redding, or about an hour from Dunsmuir or Mount Shasta. If you'd like to fly private aircraft to Klamath Falls or Weed, arrangements can be made to pick you up and return you to either of those airports. 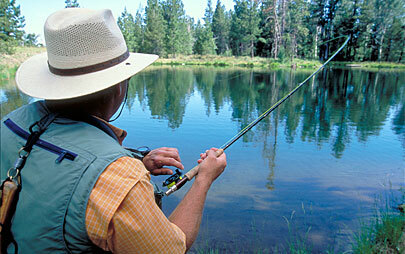 Once you arrive, there is little need for anglers to have a vehicle on the ranch. Guests are asked to time their arrival for the late afternoon (3:00 P.M. or later), allowing plenty of time to get settled, organize tackle, and be ready fish after dinner. 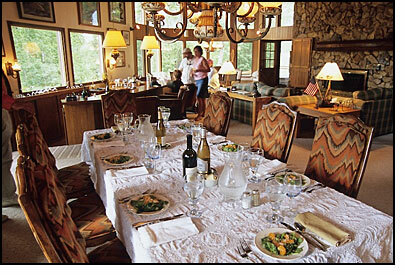 The lodge host, housekeeping staff, or chef will show you to your room, and offer a quick, informal orientation. The evening meal is intentionally served promptly at 5:30 to allow anglers time afterwards to enjoy the evening hatch activity on one of the lakes or stream. 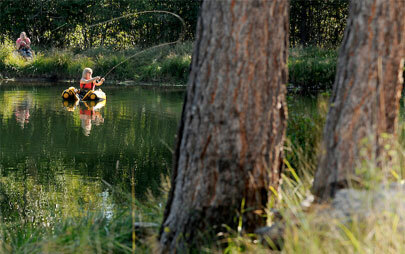 The fishing at Antelope Creek Ranch has been tailored with the self-reliant angler in mind. It is particularly suited for the fisherman that prefer the sense of accomplishment associated with a well-earned bend in the rod rather than the hand-held, guided experience. While Antelope Creek Lodge guests enjoy fine accommodations and meals, there are few of the other frills, amenities, and indulgences associated with more expensive lodge destinations. The lodge is located roughly in the middle of the property, with lakes and stream both above and downstream from the accommodations. The creek and the lakes are yours whenever anglers wish, and all of the fishing is within walking distance of the lodge. Some anglers do choose to drive to the access point near the lower lake and take the short trail to the footbridge and across to the fishing, while many others simply prefer the exercise or to fish the stream down or up to one of the lakes. Dinners are very good, by any standard. Our well-trained cooks prepare hearty, family style meals, served in an informal atmosphere that marries well with the whole Antelope Creek Ranch experience. Guests are encouraged to feed and stoke the fire in the spring and fall evenings, enjoy the outdoor fire pit after dinner, or just relax with or without the satellite television or Jacuzzi Hot Tub. Breakfast is served at 8 or 8:30 depending on the group and the season. Coffee is ready at first light and there is no hurry to be the first on the stream or either of the lakes, since no one else will be there when you arrive. The buffet lunch is on the bar at noon every day to allow for a very full morning and afternoon of angling, or fishermen may opt to pack a lunch or take along snacks and stay on the water all day without returning to the lodge for the mid-day meal. Non-fishing companions have the run of the entire ranch and as much of the surrounding countryside as they'd like to cover for hiking and relaxing. There are three superb golf courses (Mount Shasta Resort, Shastina, and Running Y) less than an hour away in opposite directions, and it is less than an hour to two of the finest bird watching areas in the Pacific flyway (Meiss Lake Tule Lake National Wildlife Refuges). Herds of antelope dot the nearby National Grasslands, and the wonders of both the Lava Beds National Monument and the surrounding Klamath National Forest are too numerous to list. Other non-angling guests may simply choose to relax in the lodge, on the deck, or yield to the temptation of the always inviting streamside hammock. Guests are asked to vacate their rooms after lunch (to allow them to be properly cleaned for any arrivals) and to depart no later than 3:00 on the afternoon of their last day at the lodge. The elevation of this ranch is too high for poison oak and poisonous snakes. The lodge is a non-smoking facility and guests are welcome to enjoy cigars or cigarettes on the deck or anywhere outside the lodge on the ranch. This is a fire-prone region, so please be extra careful with any ashes from cigarettes on the ranch proper. 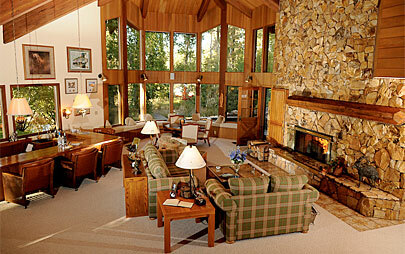 Please contact our excellent staff if you would like more information on Antelope Creek Lodge. All of our staff have been to this wonderful destination and will be happy to answer your questions. Click on the image below to get directions to The Fly Shop.